What is NPE-free Barricade ® II? NPE-Free Barricade ® II is the result of 10 years of research and testing to eliminate nonylphenol ethoxylates (NPEs) and petroleum distillate from the original Barricade formula. NPE-Free Barricade ® II has been approved for use by the US Forest Service in a wide range of firefighting functions including application by large air tankers, smaller Single Engine Air Tankers (SEATs), helicopters using buckets as well as firefighters on the ground using fire engines. Barricade ® II is the first and only liquid fire gel concentrate that has been approved for use by the Forest Service that does not contain toxic chemical additives known as NPEs and petroleum distillate oils. Environmental organizations have called upon the U.S. Forest Service to ban the use of other firefighting chemicals that contain NPEs. Is NPE-Free Barricade ® II on the Forest Service Qualified Products List (QPL)? Yes. The Forest Service placed Barricade ® II on the QPL in early 2006. What are NPEs and are they dangerous to animals or humans? Other brands of fire gels claim they are safe because they have been approved by the US Forest Service. Since NPEs are Toxic, why are they approved for use? Currently, the US Forest Service testing program that approves chemicals for use in wildland firefighting does not fully examine the potential long-term effects on future generations...it only looks at short-term health hazards. Due to recent research indicating the dangers associated with NPEs, concerned environmental protection groups have formally requested that the Forest Service cease using and rescind approvals on fire chemicals that contain NPEs and other toxic chemicals. I was told that the material safety data sheet (MSDS) is supposed to inform us about dangerous chemicals. Are these dangers disclosed on the MSDS of other brnads of fire gels? You are correct. The MSDS is supposed to instruct the layperson about the dangerous characteristics of chemical products. Read the MSDS carefully. If you see phrases such as "Proprietary Blend" or "Trade Secret" in the Hazardous Components section, they are probably trying to hide the fact that their product contains toxic chemicals. How can I learn more about the hazards of NPEs that are found in other brands of fire gels? Thankfully, it is quite easy. Simply "Google" the terms "Toxic NPEs". Is Barricade safe to use? What do I need to be concerned about? Barricade is a very safe product. It will not harm you or the environment. If you read the Material Safety Data Sheet, it states that the concentrate can be irritating to the skin and eyes. If it does get on your skin or in your eyes, simply flush with water. Note: Barricade is very slippery. The potential for slips and falls is significant. Use the utmost care when applying Barricade. If you are applying Barricade to your roof, we recommend that you apply it from the safety of a ladder. Is special protective gear required for mixing or application? No. Special protective clothing and respirators are not required. Can Barricade extinguish magnesium fires? Tests of Barricade on burning magnesium alloy have shown that the use of Barricade can greatly reduce the amount of time and water required to extinguish a fire involving magnesium. Water alone will not immediately extinguish burning magnesium; it is immediately dissociated into hydrogen and oxygen, adding fuel to the fire. The use of firefighting foam is also not effective, because the air bubbles just add oxygen to the flames. 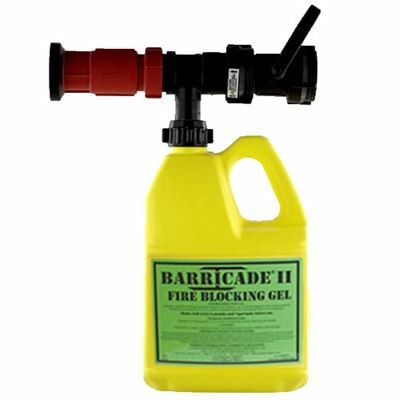 But Barricade Fire Gel helps to hold the water in suspension, and can smother the fire with cooling effectiveness. Professionals agree that treating surrounding flammables is a good first step before attacking the magnesium fire. Will the Barricade gel hurt the paint on my house? On a well maintained home the Barricade gel will not affect the paint. On a home or object that has not been painted in many years, the Barricade gel will actually clean the painted surface. This may cause it to look different from the rest of the painted surface. Can I apply Barricade to my hay barn? How will it affect the quality of the hay? Testing of Barricade on hay bales has shown that the hay is protected from burning. The Barricade-water mixture provides an outer coating and does not penetrate beyond that coating. Thus, instead of completely soaking the hay with water, as in traditional firefighting, only the outer portion is affected. Loss of hay to water damage would be greatly reduced. How much Barricade do I need? This will require a little calculating on your part. Each 1 gallon container of Barricade concentrate will coat 500-700 square feet of area. The area you cover depends on how thickly you apply the product. A ¼ inch covering is recommended. 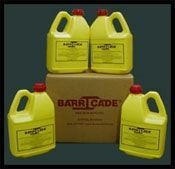 The average home will take between three and five 1 gallon containers of Barricade concentrate. Note: When coating brush, trees and plants or creating fire-breaks, the 500-700 square feet of coverage area will not apply. Where should I spray the Barricade when a fire is coming? Personal safety is paramount. Do not put yourself in danger during the approach of wildfire. Note: Defensible space is very important. Can I use well or river/lake water/swimming pool water? Yes, Barricade can be used with all water sources. Once I apply Barricade how long can I expect it to last? Depending on weather conditions such as sunlight, wind and humidity, Barricade can be expected to last from a minimum of 6-8 hours to a maximum of 24-36 hours. The thicker you apply the gel the longer it will last. We recommend that after its initial application, you lightly mist the gel with water. The applied gel is under-hydrated and it will continue to swell and offer additional protection. Note: If the Barricade gel begins to dry out it can be re-hydrated by misting it lightly with water. How thick should the gel be applied? We recommend coating the object until it is white. This usually means a coating of about ¼" thick. How much reach do I have with the nozzle on the Fire Pump Systems? This depends on how much water pressure you have. 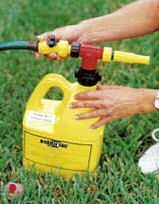 A pump supplying 30 PSI will give you about ten feet of reach. 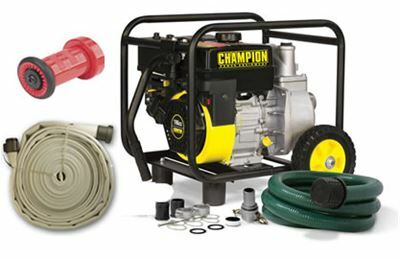 A pump supplying 50 PSI will provide 15-20 feet of reach. 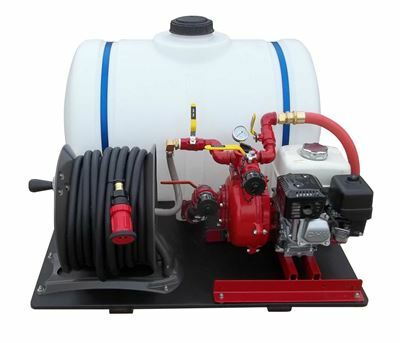 Our Portable Home Fire Pump System should provide a reach of around 15-20 feet. 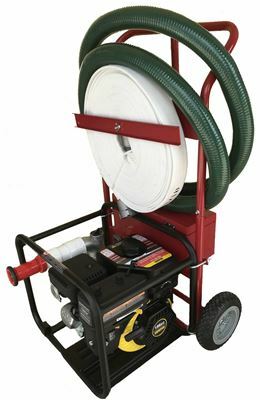 65 PSI (maximum working PSI). Our Permanent Home Fire Protection System, which is powered by an existing swimming pool motor is likely to be in the 10 -12 feet range. How do I clean up after using Barricade? When the danger has passed, rinse the Barricade gel off with plain water and a pressure nozzle. It will take a while to rinse off the Barricade, especially if you have applied a very thick coating. Basically what you are doing is over hydrating the product until it breaks down. If the Barricade gel has been left on for an extended period of time re-wet the gel and let it re-hydrate. This will make it easier to clean off. In a worst case scenario it may have to be pressure cleaned. Once you have finished using either system, the entire unit should be disassembled. Each component should be flushed thoroughly with water until all Barricade residue is gone. NOTE: Soaking the components in warm or hot water will make the cleanup easier. How do I clean my home fire defense system after each use? Once you have completed using the Home Fire Defense System, the entire unit should be disassembled. Each component should be flushed thoroughly with water until all Barricade residue is gone. NOTE: Soaking the components in warm or hot water will make the cleanup easier. What is the shelf life of Barricade concentrate? Barricade can be stored safely for a several years. The consistency of Barricade is very similar to paint as some of the product will settle to the bottom. We recommend that you shake it every six months. Barricade should be shaken vigorously for a minimum of two minutes before use. The manufacturer's warranty is for three (4) years against defects. The history of users indicates that with proper storage and handling, and with periodic agitation, the shelf life is much longer than this. For complete Warranty Information & Buyer Beware. Does it hurt the Barricade concentrate if it freezes or gets too hot during storage? We do not recommend allowing the concentrate to freeze or get to temperatures above 120° Fahrenheit. Repeated exposure to these temperatures could have a negative effect on our product.